Hemeimeem air base in Syria. Even as Russians ignore some of the major "whys" and "whats" regarding their military's operation in Syria, the tide of approval has shifted decidedly in favor of the maneuvers in the Middle East. Sociologists have interpreted recent polls to show that Russians support the operation because it has re-opened dialogue with Western countries and also allowed Russia to take a lead role on the stage of global affairs. 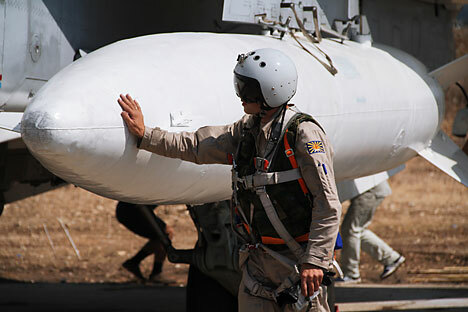 On Sept. 30, Russia began military operations against radical Islamists in Syria. Not more than five hours passed between the moment President Vladimir Putin received permission to use troops abroad and the first attack by the Russian Air Force. It happened so quickly that Russians didn’t immediately know how to react, say sociologists. However, after a little more than a week, Russia’s two major sociological services – VTsIOM (All-Russian Public Opinion Research Center) and the Levada Center – presented data showing that the vast majority of Russians approved of the campaign as a whole. According to data from the Levada Center, collected on Oct. 2-5, 72% of respondents see the threat of the Islamic state, so airstrikes are deemed legitimate. A little later, Vladimir Putin’s approval rating shattered its historic maximum and reached almost 90 percent “in connection with the events in Syria,” according to figures released by VTsIOM Oct. 22. Do Russians understand whose side they are on and against whom the Russian Federation’s armed forces are fighting? Do they understand what for? Although the war in Syria has filled the screens of Russian viewers for four years, until a year ago, it was an irrelevant topic for the Russian population. Among those who followed it, more than half did not support any of the parties in the conflict. No one took seriously the deadly threat posed by Islamic State terrorists. Some poll respondents even named the group as a probable ally in geopolitical games, says Levada expert Stepan Goncharov. “This situation persisted until the end of this summer, when information about the transfer of troops to the Russian base in Syria was leaked in the media,” Goncharov said. First attacks by Islamists from ISIS, Jabhat al-Nusra (a branch of Al-Qaeda) and other radicals hardly displaced the Russian media’s then most popular topic – the crisis in the southeast of Ukraine. Ukraine was a cause for concern, but this was “only Syria,” said Yekaterina Schulmann, a political analyst and associate professor at the Institute of Social Sciences at the Russian Presidential Academy of National Economy and Public Administration (RANEPA). The beginning of the Russian operation in Syria was also seen positively as way to return to dialogue with Western countries and break out of isolation. This support is a manifestation of an anti-American trend, according to Mikhail Korostikov, a political analyst on international affairs and the head of the Strategic Development Department at the Moscow State University of Economics, Statistics and Informatics. “The main thing is to have a clear enemy, and to look better than Americans – this is already enough, is not so important what exactly is going on there,” Korostikov said. Putin has also found supporters in those who who lament Russia’s drastically reduced influence in the world since the disintegration of the U.S.S.R.
“If Russia had not entered the Syrian conflict, and Assad – our last ally – had fallen, Russia would simply not participate in the politics of the 21st century,” said Maxim Shevchenko, a journalist and member of the Human Rights Council under the President of the Russian Federation, speaking on the Ekho Moskvy radio station. Those who aren’t involved in the Middle East cannot say they really participate in world politics, according to Shevchenko. But Syrian campaign enthusiasts include those who are ready to go to war “for justice” in any part of the globe, whether Syria or Ukraine. “What’s the difference, Syria or Novorossiya [eastern Ukraine]? There is mayhem going on both here and there and somebody has to stop it,” said Igor Uglich, a Donbass veteran and volunteer who together with friends joins groups on social networks, seeking ways to go to Syria. The Ministry of Defense did not reply to a RBTH request concerning the number of Russian volunteers in Syria. The bottom line is, despite the many people who approve of the Russian intervention, Russian citizens do not understand the intricacies of Middle East politics – and they do not want to understand. “If they do know something about it, it is only from old Soviet clichés – the ‘Arabs’ and ‘Israel.’ The situation in Syria and its various Islamist trends... it’s just not interesting to them,” said Leonty Byzov, a leading researcher at the Institute for Comprehensive Social Studies at the Russian Academy of Sciences. Asking people for more details, such as who is fighting there and for what, reveals that people’s opinions are based wholly on TV shows and news reports, said Byzov. “They believe that Putin understands better, and if it is supported by the Federation Council, then it’s probably right,” he said. Still, both the public and the media are concerned about how far Russia can go in Syria, especially when it comes to the sensitive issue of possible casualties.